As the cradle of western civilization, of democracy, philosophy, the theatre, and so much more, Greece has drawn visitors for centuries. All have extolled the purity of its skies, the overwhelming hospitality rooted in its ancient civilization and the zest for life of the Greeks themselves. Obviously, Greece is synonymous with antiquity, with Athens in particular a city of intriguing paradoxes – ancient yet modern; busy and frenetic but so laid-back; a capital city, yet in places as intimate as a village. 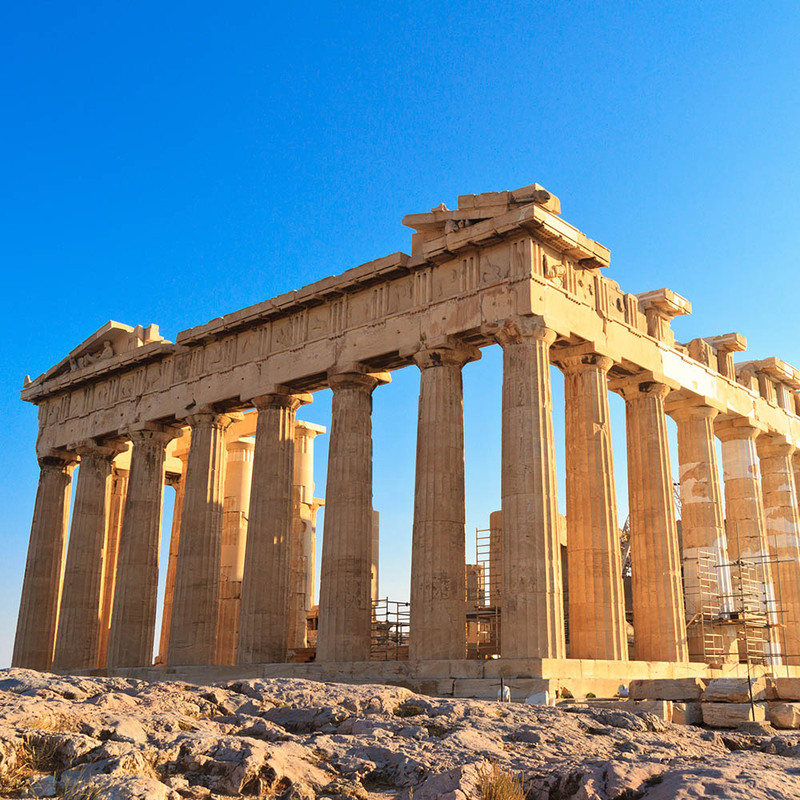 And if one building can ever symbolise an entire nation, it is the Parthenon – but Athens is much more than this. The hugely acclaimed new Acropolis Museum succeeds wonderfully in displaying the outstanding ancient masterpieces within to the finest effect. 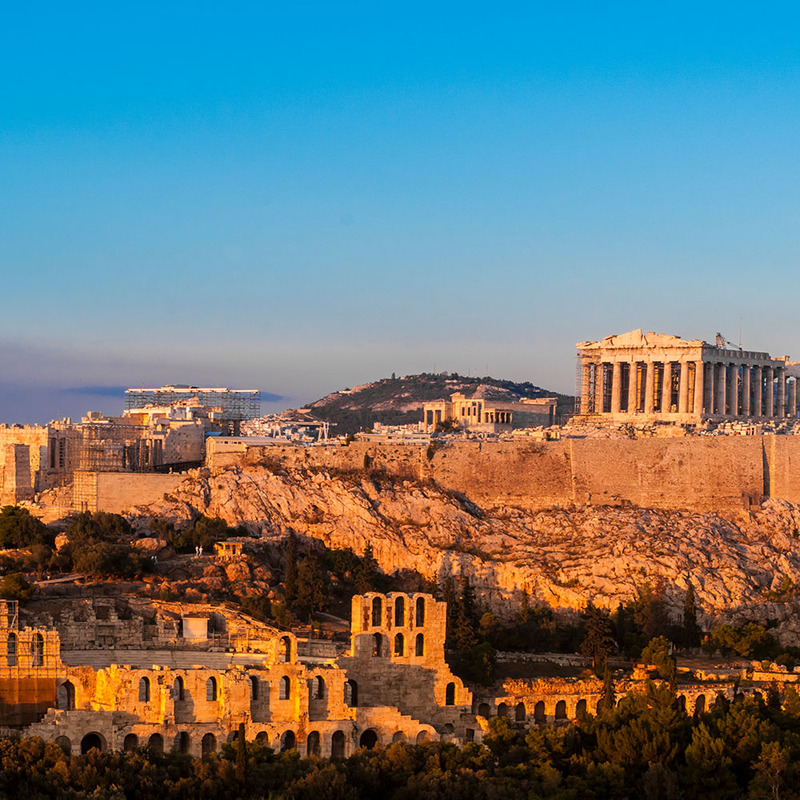 Our tour visits the very best of Classical Greece: firstly, you spend a night at the centre of the world! At least that’s what the ancients believed Delphi to be – the world’s navel, where mortals, via the ‘oracle’, communicated with Apollo. 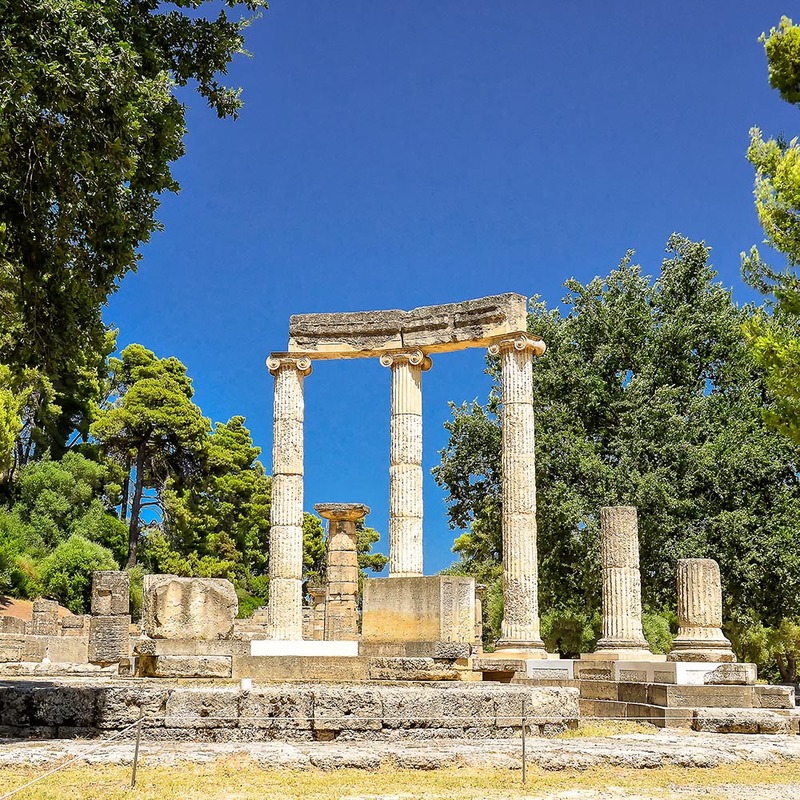 In complete contrast, Olympia, birthplace of the Olympic Games, is set in an idyllic pine-forested valley, and is the very spot where the modern Olympic torch is kindled from the rays of the sun. Then there’s Mycenae, and a very different experience – a place of pre-classical Bronze Age myths and legends and of a fierce, untamed people so vividly depicted in Homer’s epics. 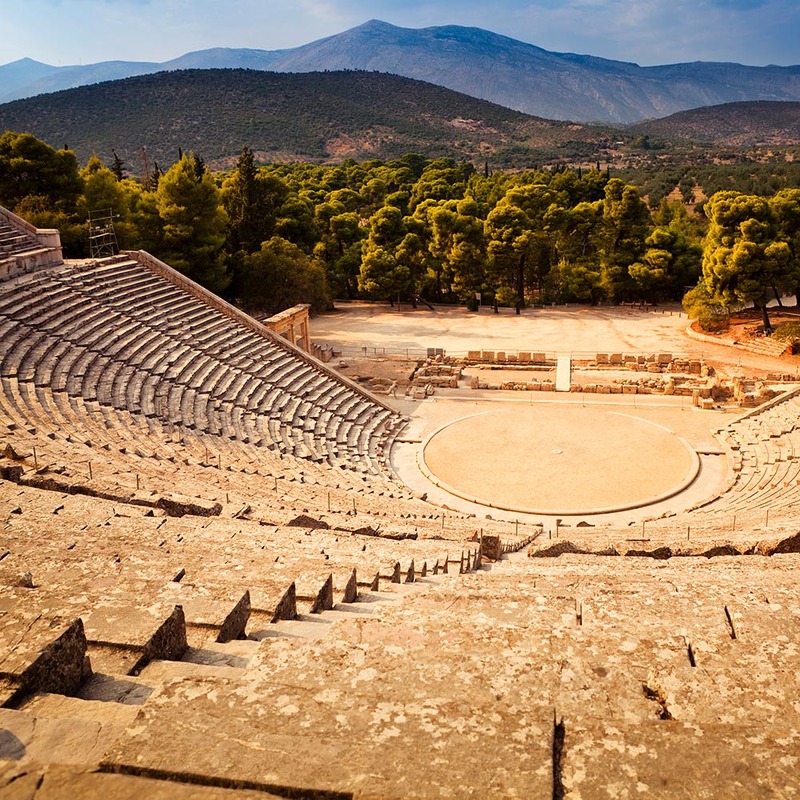 You also tour Epidaurus, the greatest healing centre and finest theatre in the ancient world. We also stay for three nights in one of Greece’s most charming and sophisticated small towns, Nafplion. Guarded by two imposing Venetian castles, the old town of Nafplion is a jumble of red roofed houses overlooking a wide sheltered bay. The town’s air of quiet elegance draws weekend visitors from Athens and many of the older mansions have been sympathetically renovated, whilst the wide, palm lined promenade and charming central square are the perfect places to while away an afternoon. Greece though is far from being a series of ancient sites, there is some startlingly beautiful scenery too: the steep ravines of the Peloponnese Mountains are spectacular, their peaks rocky and barren, whilst heather and broom cover the slopes and the enchanting scent of wild thyme and oregano hangs heavy in the warm air. The views from Delphi in particular are quite exceptional, with the valley below a silvery sea of olive groves. And in Greece we are never far from the sea – innumerable bays, coves and headlands form one of the most enchanting coastlines in the world, with islands and distant mountains shimmering under cobalt blue skies. Greek cuisine, known for its simplicity, has been legendary for centuries, with many previously unknown regional dishes now becoming standard fare – try stuffed courgettes and dolmades made from tender cabbage leaves or a salad of ‘horta’, mountain greens with lemon and olive oil, or perhaps a ‘stifado’, a stew which can be made with beef or wild boar. And of course, there’s nothing like some freshly-caught fish just simply grilled and enjoyed under a starlit Mediterranean sky in a genuinely atmospheric taverna! So come with us and enjoy one of the most beautiful and intriguing countries in the world, and catch a glimpse of the fine slender threads that still join our modern world to the distant past in ancient Greece. You should arrive at the airport for your flight to Athens, transferring to the excellent quality four-star Hotel Divani Palace Acropolis for one night, with breakfast. The hotel is superbly located in a quiet residential area, nestling below the rock of the Acropolis, just a few minutes’ stroll from the new Acropolis Museum and the Plaka district with its atmospheric tavernas and traditional shops. All rooms are air-conditioned with balcony, satellite TV, safe, mini-bar and hairdryer. There’s a small pool, a lobby bar, a top-class open-air rooftop restaurant with great views of the Acropolis and in the basement you can even see an exposed section of the ancient city walls. This morning you have a walking tour of Athens, visiting firstly the Acropolis, so fittingly one of the great ‘Wonders of the Ancient World’. Ascending the hill you soon experience the Parthenon itself – its blindingly white marble columns with their perfect symmetry and balance completely dominate the skyline. We also visit the new Acropolis Museum with its amazing glass floor displaying ancient houses, streets and even an olive press below. Exhibits include superb sculptures and an incredible series of carved pediments from the temple of Athena. We then explore the picturesque old district of Plaka. This area dates from when Athens had shrunk to no more than a village below the Acropolis by the end of the 18th century. It is utterly charming, being crammed with neo-classical mansions, balconies overflowing with geranium pots and twisting cobbled lanes line with homely tavernas, their tables spread across the street. After some free time for lunch we leave Athens and drive north past Mt. Pendeli, from where the marble of the Parthenon was quarried and drive through Thebes, before starting the ascent of Mt. Parnassus, site of the Delphic oracle. We stay at the centrally-located simple three-star Acropole or Fedriades, with dinner. 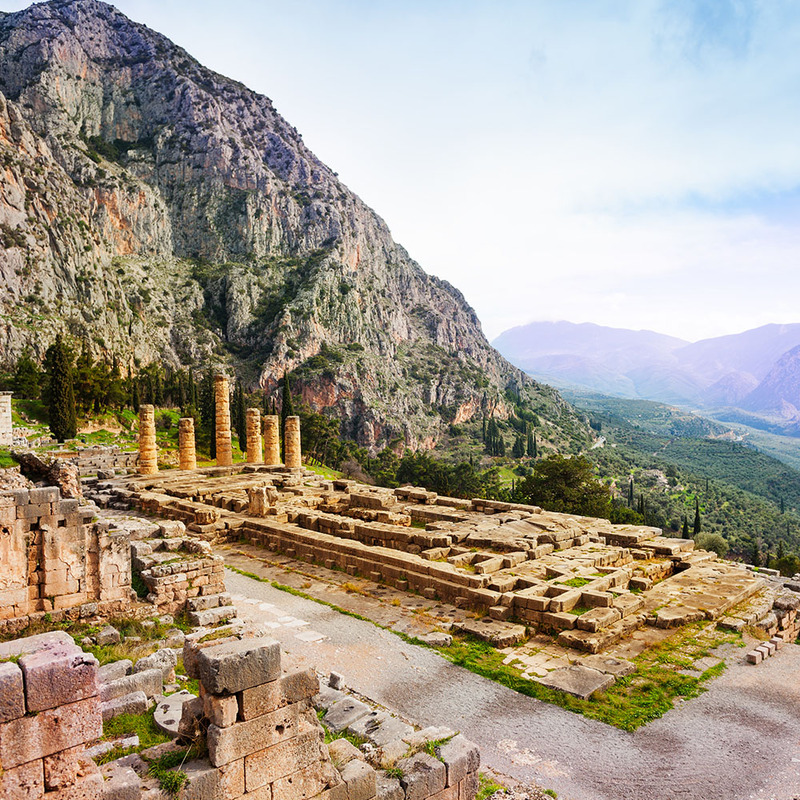 Delphi is simply amazing, with a unique wealth of monuments dedicated to Apollo. The setting has an extraordinary natural beauty, in a series of terraces overlooked by the lofty crags and cliffs of Mt. Parnassus, with birds of prey soaring on the thermals above. As we enter the sacred sanctuary you’ll see the treasuries which were crammed with gold, silver and all kinds of precious objects donated by grateful city-states after having had the benefit of the god’s wisdom. Overlooking it all is the superb temple itself and below, in an underground chamber, was a geological fault which probably emitted mind-affecting vapours from deep within the earth. This was where the oracle relayed the god’s thoughts and wisdom, which were always open to several interpretations - in return for a fee! The adjacent museum has some of the finest exhibits in the country, including the spectacular, full-size ‘Charioteer’, a masterpiece of ancient bronze sculpture and one of only a handful ever recovered intact. In the afternoon we drive westwards, passing through a timeless Greek landscape of tiny isolated villages, olive groves and rolling hills. 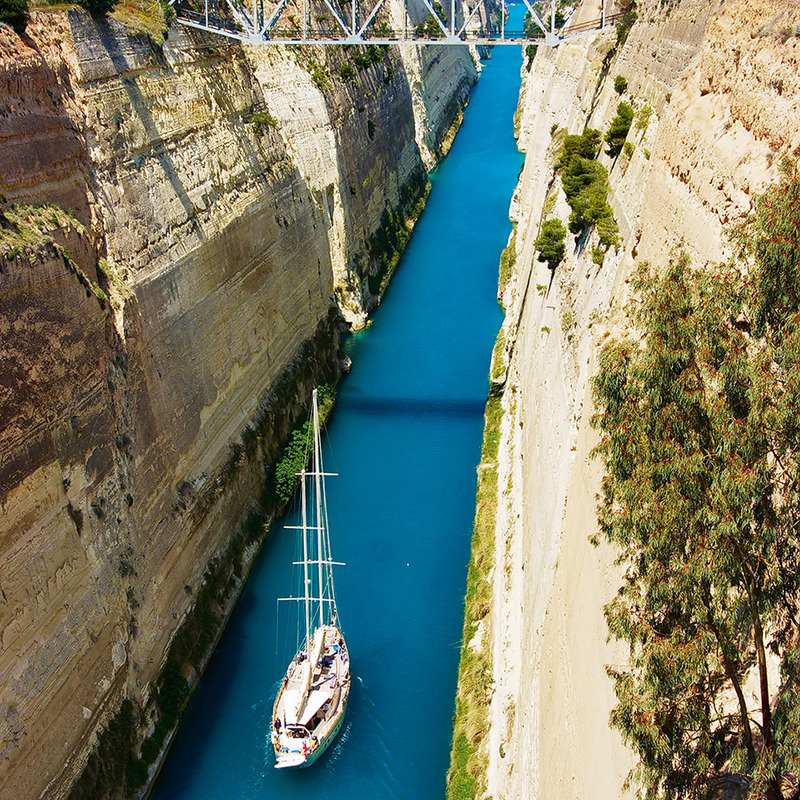 We cross the huge spans of the amazing new Rio bridge connecting the mainland with the Peloponnese and continue southwards to the site of ancient Olympia, where we stay for one night at the excellent three-star superior Best Western Europa. Beautifully situated on a quiet hillside, the hotel features low-rise buildings set in lovely gardens, an open-air pool and an excellent restaurant where we take our included dinner. The ancient Olympic Games were as major an occasion then as they are today – though hopefully cheaper to stage! Taking place every four years, the stadium had a staggering capacity of 45,000, an enormous number and a clear indication of the event’s importance. All military conflicts ceased for the duration and huge rewards were conferred on the winners, whilst penalties for cheating included fines, bans and public embarrassment - how little has changed! Events included the discus and javelin, sprinting and wrestling. The Olympiad continued for about 1,000 years and we’ll experience a fascinating tour of the site, also visiting the excellent museum housing numerous extraordinary finds. This afternoon we experience the spectacular wild and mountainous landscape of the Peloponnese, driving through the province Arcadia, known as the land of the god Pan and woodland nymphs in antiquity. In the afternoon we arrive in the small town Nafplion, our base for the next three nights at the four-star Amphitryon Hotel, with breakfast. Nafplion is one of Greece’s loveliest seaside towns, crowned by two massive castles built by the Franks and Venetians and attacked in turn by the Ottomans and the Greeks themselves during their War of Independence. In fact, Nafplion was chosen as Greece’s first modern capital in 1825 before it was moved to Athens five years later. The town has kept an air of quiet sophistication, with a beautiful pedestrianized waterfront promenade, lined with comfortable cafés and tavernas, a marble-paved main square and lots of fascinating boutiques and galleries set between the neo classical red-roofed houses. This morning we visit Epidaurus, birthplace of Asclepios - the god of healing, and whose sanctuary here became the greatest centre of medicine in the Classical world. The ancient Greeks believed that one should be healthy in both mind and body, so the plays and music performed here in the acoustically perfect theatre played an integral part in the therapeutic process. We then visit Mycenae, entering the imposing citadel through its magnificent 3,300 year old Lion Gate, where you can still discern the pivot holes carved for the door hinges. We return to Nafplion in the afternoon, with the rest of the day at leisure to explore this delightful town. 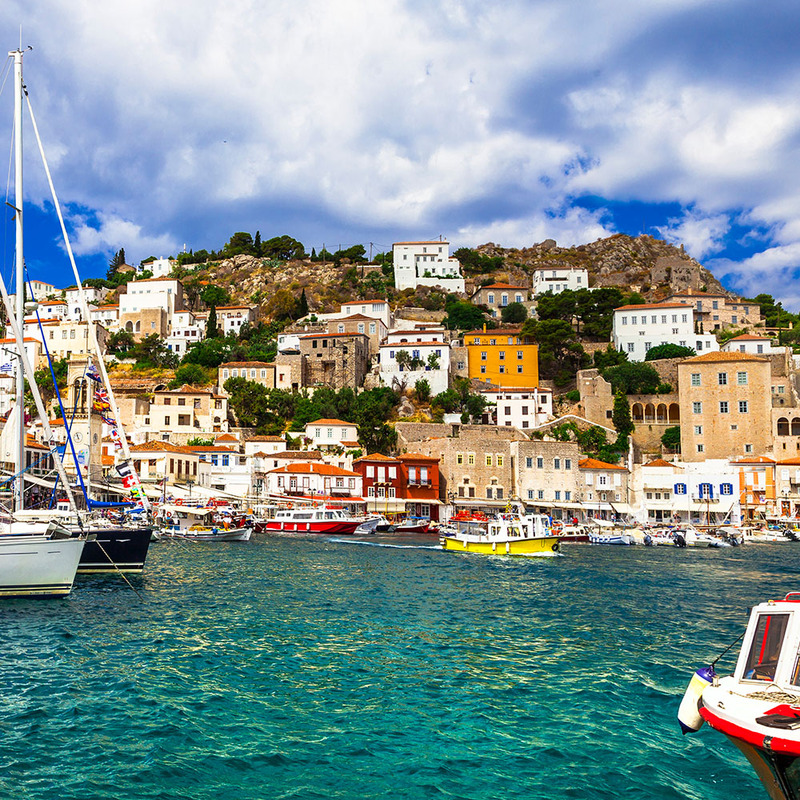 Of course Greece, whilst being renowned for its ancient sites, is equally famous for its stunning islands, so today we offer an optional trip visiting two of the most beautiful: Spetses and Hydra. Spetses is the most southerly of the Saronic Islands, just a few hundred metres from the Peloponnese coast. Its pine-covered low hills lead down to a really attractive main town, full of narrow alleyways, charming houses, shady squares and waterfront restaurants around the old harbour. There are very few cars allowed on the island so horse-drawn carriages remain a popular way to get around. As our boat rounds the headland you get your first glimpse of one of the most attractive anchorages in the entire Aegean: Hydra’s lovely harbour, full of traditional ‘caiques’, whilst ascending the hill behind them is row upon row of opulent mansions, once owned by rich shipping families. Most streets are too narrow or steep for cars, so take some time and wander where your feet take you, enjoy a coffee, and absorb the unique atmosphere that is the Greek islands. Today we say goodbye to Nafplion and head back to Athens, via the Corinth Canal, for our last night at the Divani Palace Acropolis. The afternoon is at leisure: how about some shopping in the nearby flea-market? The centre of the city is within walking distance, with Constitution Square and the opulent Hotel Grande Bretagne where Churchill stayed. The Tomb of the Unknown Soldier is guarded by the elite National Guard, ‘skirted’ in the instantly recognisable national costume and opposite is Athens’ best kept secret, the extensive National Gardens, full of winding sandy paths, hidden grottoes, pergolas and shady ponds. Today at the appropriate time, the coach will transfer you to the airport for your return flight, after a most fascinating and unforgettable tour. The price of this holiday is per person based on two people sharing a twin room. Single rooms subject to availability at a supplement per person. 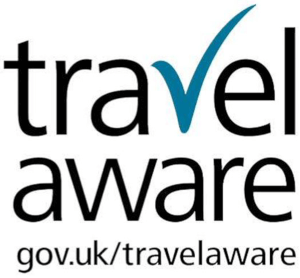 Seven nights' accommodation in three and four-star hotels; daily breakfast and two dinners; scheduled return flights to Athens; all airport taxes and transfers; all local accommodation taxes and the services of a Riviera Travel tour manager. Included excursions are a walking tour of Athens and guided visits to the Acropolis, Epidaurus, Mycenae, Olympia and Delph. Not included are entrances to archaeological sites and museums - approximately €56 per person.